Necker Island can accommodate 26 - 28 people, in The Great House including The Master Suite and several one-bedroom Balinese houses. The Bali Cottages are within easy reach of the main house but offer a little more privacy for those who would like to escape from time to time. They each have an open-air sitting and dining area, which can be used for lunches during your stay or late night parties away from the main house. Necker Island is situated in the British Virgin Islands. 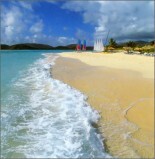 The nearest islands are Virgin Gorda (15 minutes by boat) and Beef Island/Tortola (30 minutes by boat). From Beef Island guests are collected by our high-speed boats (before sundown) unless guests prefer to travel by helicopter directly to the Island. Please note that if you fly into Barbados or St Lucia there are currently no connections that can be made on the same day to Tortola, you would have to overnight and catch a morning flight,unless you choose to charter your own small plane. Necker Island is Sir Richard Branson’s own private island and is found in the British Virgin Islands, a jewel in the sparkling blue Caribbean sea. Necker has a general Balinese theme and exudes the elegance and lifestyle of the rich and famous. You can "rent" the whole island for yourself and your guests, staying in the cliff-side villas with your own pool and never-ending views to the sea. 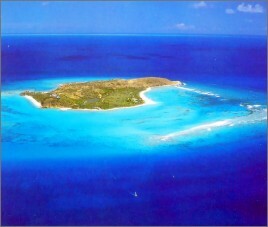 Virgin Atlantic owner, Richard Branson, purchased this previously uninhabited island between Tortola and Anegada in the '70's. He has slowly developed several residences in addition to the main house, an airy Balinese Villa. A favorite with royalty, rock stars, and movie stars, Necker Island is the ultimate private getaway in the Caribbean. The staff outnumbers the guests here, providing first class service and catering to your every whim. Enjoy a tropical drink in the indoor garden, or on one of the terraces overlooking the British Virgin Islands only a few minutes away by helicopter or boat. Meals are as informal or formal as you desire, and at the pace, time and location of your choosing. Your staff can prepare a light lobster lunch with fresh fruit served in the shade of the pagoda, at the beach pool's floating dining pavilion, or a more formal affair in the 26-seat dining room with silver, lace, linen and crystal place settings. Pamper yourself and absorb the enchanting feel of Necker Island. Necker Island provides you with the space and time to do just as you like...when you like, escape to an unforgettable island happily out of step with the world. The ultimate all-inclusive private island resort. At Necker you can choose to do as much or as little as you please. Every morning after breakfast staff will ask everyone what they would like to do for the day. The choices are almost endless... There is a full range of water sports available along with instruction, including windsurfing, waterskiing, sailing, wakeboarding and sea kayaking. We have some great areas for snorkelling and can take you to other areas of the BVIs for this too. For those who love the water but want to be less active, there are two main swimming pools and beaches offering safe swimming. There is also an aqua trampoline for extra fun! The Beach Pavilion is a wonderful place to spend the day (or night! ), and houses one of the most stunning pools around! It can be accessed from both land and beach sides, there is a swim-up bar complete with rocks in the pool where guests can sit and enjoy a drink. It is a freeform infinity pool complete with counter-current swimming, a water exercise machine and a waterfall. Within the pool complex is our thatched Crocodile Pavilion, complete with a large solid teak crocodile table where guests can be served fresh fare from the Pavilion's gourmet kitchen. If you prefer to keep your feet dry we have plenty of options including two tennis courts, an air conditioned gymnasium, lots of board games, chess, books and a huge range of DVDs and CDs. There are also plenty of things we can arrange for you to do off the island such as deep sea fishing trips, scuba diving, yacht charters and helicopter trips for shopping or island hopping. Or, you could find yourself a hammock with a beautiful view and let the gentle sea breezes caress you into blissful oblivion... Breakfast, lunch and dinner are informal affairs, laid out either in the dining room, around the pool or on the beach. The style of cuisine takes advantage of as many locally produced fruit and vegetables as possible and fresh fish is always a favourite. Guests can choose to let us make all the arrangements or can have menus designed especially for them. Beach barbecues are always a favourite, whilst the sushi bar in the Infinity pool is a once in a lifetime experience. The chefs love to do themed nights, our Chinese Yum Cha night for example. The island staff will make all of the arrangements for you, creating settings and menus you will remember long after you return. Special dietary requirements are catered for. Pool: 2 Spa Pools Infinity Pool. Villa Features: Bar, Business Facilities, Helicopter Landing Pad, Spa, Private Beach. Leisure Amenities: Sailboat, Snorkel Equipment, 2 Tennis Courts, Water Skiing Equipment, Windsurfer, Sea Kayak .